I use the unexpected medium of clay, commonly fashioned into utilitarian vessels and dinner ware, to symbolize the diversity of roles assumed by women in the 21st century. From the safe harbor of home to an arena of mass appeal, women, what they pursue and where they find themselves in the world are reflected by this series of dresses. This post-feminist observation of female identity ranges from the private domain of a gardener who lovingly nurtures plants to grow to the nationally televised public humiliation of pop singer Janet Jackson during the country’s most widely watched sports event. 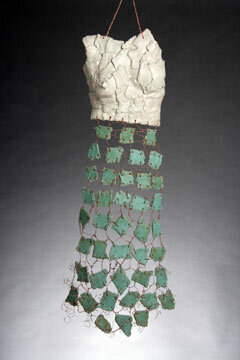 Ceramics and wire are manipulated into representations of what woman accomplish in and out of the public eye. 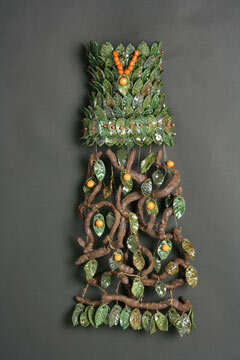 As fantasy abstractions of this form, my dresses respectfully acknowledge all that women accomplish, whether they are connecting with nature or dancing onstage.